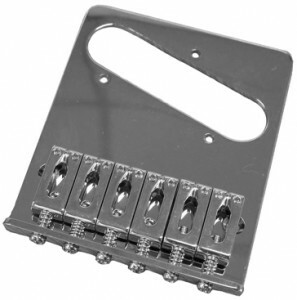 Back in stock – Fender Modern 6 Saddle Telecaster Bridge. Comes with an allen/hex wrench for saddle height adjustment. This model bridge is fitted to the Fender Standard Telecaster and is great for those wanting a modern look and feel. Individual saddles allow accurate intonation. This bridge is a direct replacement for vintage bridge plates – it has the same mounting and string through hole patterns and is compatible with our Mighty Mite bodies. Please note that it will not fit American Standard/Series models. Available in the Axecaster store. This entry was posted in Product updates and tagged Fender, Hardware, Products, Telecaster. Bookmark the permalink.